Makepeace Electrical Limited - Electrician, PAT Testing based in Witham, Essex. 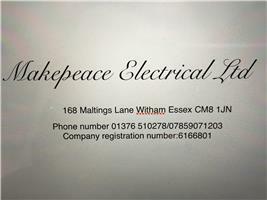 Makepeace Electrical ltd is an electrical contractor based in Witham in Essex. We have 25 years experience and cover all of Essex. We are a NAPIT registered PART P company dealing with all aspects of Domestic and Commercial Electrical Work. We offer free quotations are available at a time to suit you. If you require a new light fitting or a full rewire or anything in between we will always be happy to offer you advice and a very competitive quote. Witham, Maldon, Braintree,Chelmsford and all of Essex.